Monthly General Membership Meeting: 2nd Tuesday of every month at Platte Canyon Fire Station on Crow Hill, 153 Delwood Dr, Bailey from 0730-0900. Breakfast is $5, and comes from Cutthroat Cafe. Join us on the 2nd Tuesday of every month at Platte Canyon Fire Protection District's Crow Hill Fire Station from 7:30-9:00am to share news, events, and information that helps promote our Bailey area and your business or nonprofit! Breakfast is catered by Cutthroat Cafe: scrambled eggs, hash browns, bacon, and delicious green chili, and costs only $5. You do not have to be a member to attend the meeting! Annual membership in the Platte Canyon Area Chamber of Commerce is only $100.00 - a great value to help promote your business! We hope you'll join us! To encourage business growth and a strong community by providing information and advocacy for members. Since its inception the Platte Canyon Area Chamber of Commerce has strived to help local businesses by providing a unified voice in the community. The chamber works hard to bring tools and resources that help business grow, while maintaining the beauty and integrity of our area. 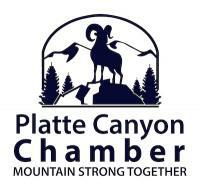 The Platte Canyon Area Chamber of Commerce is a private, non-profit organization supported by its members. The chamber receives no funds from state or local government. The chamber is funded solely by membership dues, advertising revenue and special events.